If John DeLorean had his way back in the late 1960s, there might not have been a Trans Am. Seems DeLorean was more interested in promoting and building his radical Banshee XP-833 concept car. However, the brass at General Motors felt the Banshee was too much like the Chevrolet Corvette, and they crushed any hope of DeLorean bringing it to production. The good news is DeLorean conspired with Herb Adams, Pontiac Special Projects Lead Engineer, to create a car that would become a legend, and thus, the Trans Am was born. In recognition of the Trans Am’s 50th birthday, Horsepower Memories looks back at some of the most notable Trans Ams from all four generations. Pontiac introduced the Firebird Trans Am at the 1969 Chicago Auto Show. Known as the Trans Am Performance and Appearance Package, Pontiac’s version of the pony car was snuck in under the radar with little fanfare. 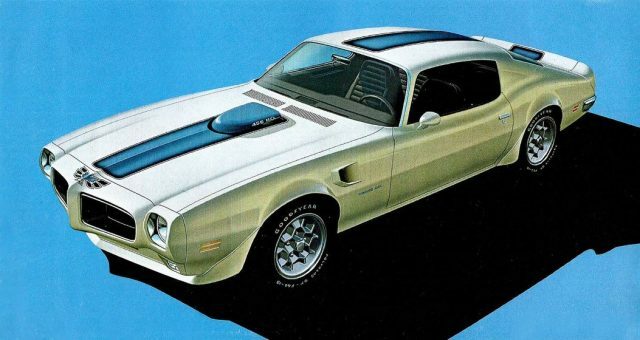 Only 689 hardtops and a mere 8 convertibles were built for the Trans Am’s inaugural year. The 1970 model year was radically different from before with a longer nose and sloping rear contour. Front fender air extractors, Endura front bumper, and a rear-facing shaker hood scoop are just a few of the outstanding features of the new Trans Am. A Ram Air IV engine pumping out 370 horsepower was an available option. There were only 88 takers. The 1973 and 1974 Super Duty Trans Ams are something of an anachronism. They were the last hurrah. Relics from a bygone era when muscle cars had fallen prey to rising gas prices and soaring insurance rates. These holdouts were rated at 290 horsepower and 390 lb.-ft. of torque. These were unheard of numbers for this time period. While others had given up on the muscle car, Pontiac carried the torch. 1976 was a special year. It marked our country’s bicentennial and was also Pontiac’s golden anniversary. And what better way to celebrate this milestone than with a special edition Trans Am? The 50th Anniversary Limited Edition came dressed in Starlight Black with gold accent striping. The 50th Anniversary Edition also included gothic Trans Am lettering and a unique 50th anniversary fender badge. Approximately 2,600 of these special editions were built. This is probably the most famous Firebird Trans Am of all time. The 1977 Special Edition was the car picked by Burt Reynolds and director Hal Needham to star in the movie Smokey and the Bandit. The story goes that when Burt saw the Special Edition in the 1977 Firebird brochure, he knew it had to be in the movie. After the movie’s release, Trans Am fever hit the U.S. and sales of the car jumped considerably for the next few years. After the success of the 1977 black and gold Special Edition, Pontiac tried reversing the paint scheme and created the 1978 Gold Special Edition. The Y88 Gold Special Edition included Solar Gold paint with dark gold pin striping, gold headlight opening trim, gold Pontiac nose emblem, and gold tinted T-tops. Gold 15×7-inch snowflake wheels with gold emblem center caps were also standard equipment. The package added $1,259 to the price of the Trans Am. One of the most striking features on the car was a new 5-color “screaming chicken” hood decal. To commemorate the Trans Am’s tenth anniversary, Pontiac celebrated with the 10th Anniversary Limited Edition. This special edition is unmistakable with its silver and charcoal paint, silver-tinted T-tops, and turbo cast aluminum wheels. The Firebird decal was so large, its wingspan stretched out onto the front fenders. The most desirable anniversary models are the ones equipped with the Pontiac W72 400 cubic-inch engine and four-speed manual transmission. Very few of these were ever made. The 1980 Limited Edition Turbo Trans Am was the first Trans Am chosen by the Indianapolis 500 and NASCAR to be their official pace car. The car featured bright Cameo White paint with charcoal accents. Under the hood was a 301 cubic-inch engine with a Garrett turbocharger that produced 210 horsepower and 345 lb.-ft. of torque. Approximately 5,700 of these limited edition pace car replicas were created. Chances are, not many of these are roaming the streets today. The third generation Trans Am finally arrived for the 1982 model year. This new Trans Am was the first to feature pop-up headlamps and a rear hatch. It was eight inches shorter and 500 pounds lighter than the previous generation. The new Trans Am also touted a drag coefficient of only .31 which, at the time, was the best of any production car General Motors had ever created. A notable option this year was the Y84 Recaro Trans Am which featured charcoal parella Recaro bucket seats. The 1989 20th Anniversary Pace Car featured a turbocharged 3.8-liter V-6 that was previously used in the Buick Grand National and GNX. It produced 245 horsepower and 340 lb.-ft. of torque. This powerplant made the 20th Anniversary Pace Car the quickest Firebird ever sold at the time. Pontiac only built 1,500 of these. Each one of them came in monotone white paint with a camel interior. The 1991-2002 Firehawk package by SLP Engineering was available on the Trans Am coupe and convertible, and Formula coupe models. For 2002, the last year of production, the Firehawk’s LS1 produced 345 horsepower and 345 lb.-ft. of torque. The Firehawk came standard with a high performance dual exhaust, 17×9-inch wheels, and Firestone Firehawk performance tires. Performance was quite good for the time. Car and Driver tested a 10th Anniversary coupe and walked away with a 0 to 60 time of 5.1 seconds and a quarter mile finish of 13.6 seconds at 106 mph. To celebrate the Trans Am’s silver anniversary, Pontiac created the limited-production 25th Anniversary Trans Am. This model featured Bright White paint with a Bright Blue center stripe, special 25th Anniversary aluminum wheels painted in white, and white prado leather seats with blue embroidery. A 5.7-liter V8 with sequential-port injection and 6-speed manual transmission was standard equipment on this special model. 1999 marked the 30th anniversary of Woodstock and Neil Armstrong’s walk on the moon. It also celebrated the Trans Am’s 30th anniversary. The 30th Anniversary could be ordered as a coupe with Artic White paint with blue hood stripes or a convertible with a Medium Navy Blue top. This special editon also included blue-tinted 17-inch aluminum wheels. If seeing this car gives you a feeling of déjà vu, maybe that’s because the paint scheme closely mimics the original Trans Am from 1969. After 33 years of production, Pontiac closed out Trans Am production with the 2002 Collector Edition. It featured Collector Yellow paint with black accents, black 17-inch aluminum wheels, and unique Collector Edition badging. The WS6 Performance and Handling Package, which included ram air, dual outlet polished exhaust, and Goodyear Eagle F1 tires, was also standard equipment. This is it. The very last Pontiac Trans Am ever produced. On September 25th, 2001, General Motors announced the end of the Pontiac Firebird and Chevrolet Camaro. On August 31st, 2002, this red convertible was the last Trans Am to roll off the Ste. Therese, Quebec assembly line. It was the end of an era. Pontiac would soldier on a few more years before being a victim of GM’s restructuring and bankruptcy. On April 27th, 2009, it was announced that General Motors planned to discontinue the brand, along with a few other, and focus on Buick, Cadillac, Chevrolet, and GMC. The company brought back the GTO in 2004 and introduced the G8 in 2008, but these weren’t enough to keep the brand going. Those hoping for a return of the Trans Am were crushed by the news. Long live the Pontiac Firebird Trans Am!